Make It All Work (MIAW) is a full-service technology, consulting and web development firm based out of New York City. Our specialized tech team is made up of some the best website coders, SEO experts and mobile app developers that will tackle your project with the highest quality and standards. With over 15 years in the tech business, Make It All Work has helped businesses with all things web development and technology related. We help bring brands to life by designing classy, clean and modern websites using the highest standards of development and coding practices. We also maintain websites, manage your web presences, handle all types of SEO / Search Engine Optimization, develop custom hosting, server solutions, develop mobile apps and more. Learn more in our services section below. Our NYC based tech team is made up of world class engineers, coders, designers, technicians, website developers and makers. We guarantee to provide exceptional work, be communicative and responsive and will provide support and guidance throughout your journey to success online and off. Make It All Work specializes in full service website development. Our experienced team of website designers, coders, programmers, DevOps engineers and system administrators will deliver professional, quality websites for businesses of all sizes. Learn more about our web development and website maintenance services. Talented, strategic and hands-on, MIAW has been a true partner in the development of our new website. They not only exceeded our expectations with their professionalism, creativity and ability to respond to our needs, but also showed true talent and empathy in translating our vision into a finished product that reflects our identity and core values. We offer extensive code and web server infrastructure auditing services. We evaluate whether or not your site code needs to be refactored for scalability, and can work with your existing development team to provide supplemental expertise as needed. We can facilitate transformation of your MVP codebase into a fully scalable platform ready for enterprise software clients. We are able to examine your site architecture, infrastructure, spot bottlenecks and potential points of weaknesses or failure. We offer this tech auditing service independently or in conjunction with our web development services, Symfony development consulting, and AWS consulting. Our online marketing strategy & advisory services are focused on growth. We offer consulting and execution in both organic and paid PPC / CPC campaigns, social media, influencer and additional marketing areas. We do Search Engine Optimization / SEO audits and online content marketing. We advise startups and businesses on digital advertising / PPC initiatives, including marketing and remarketing ad campaign launching & management on a variety of platforms and marketplaces including Google Ads (formerly AdWords), Facebook, Instagram, Quora, Bing and LinkedIn. We can help tackle your next audio / video project. Whether it’s creating an entire video studio in your office, or tweaking your projector for your next presentation. We’ll make sure you only have to focus on your creative project, without having the hassle of dealing with mic setups, speaker issues, or any other technology related distractions. We have years of Symfony developer experience creating apps and websites with the leading PHP framework, going back to the days of Symfony 1 up to the best practices and standards of Symfony 4. Below are some of our recent website projects. These projects exemplify our commitment to quality and expertise, while keeping our clients’ goals in mind. GoReminders simplifies appointment management for small businesses, saving them time and increasing revenue. 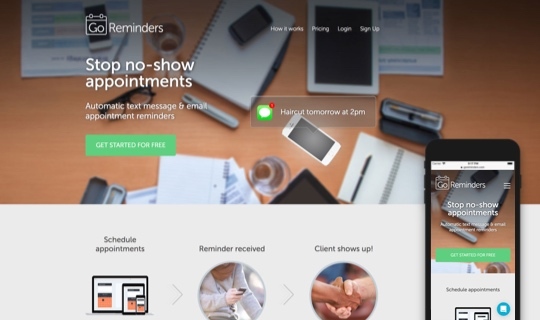 It automatically reminds your clients about upcoming appointments via text message or email. For many of their users, it’s a smart replacement for their appointment book that reduces no-show appointments. Have a tech, SEO, website or mobile app development project you’d like to discuss? Call or email us and We’ll get back to you within an hour during normal business hours.